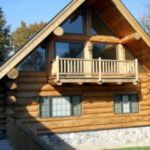 Your log home is a major investment so when it is time to put a new coat of stain or finish on it, it’s important to know your options and know the differences between the types of log home stains available on the market today. 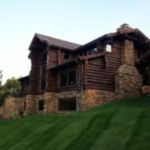 Edmunds & Company is strictly in the business of restoring log homes, which means we have seen hundreds of log homes that needed re-staining in our 40+ years of experience. Some stains “perform” better than others. This means they last longer, retain their water repellency longer, and consequently – protect the logs better. 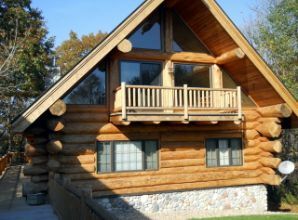 There are several modern finishing products that are suitable for log homes. All of them penetrate the surface of the log and also provide a protective film on the surface. A good finish should contain a maximum amount of solids, some mildew inhibitor, and Ultraviolet blockers. There are basically two types of finishes we recommend – semitransparent and solid body stains. 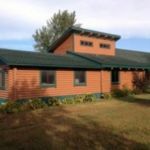 The type of finish chosen depends upon the log home’s specific wood, the appearance the homeowner desires, and the level of maintenance that is acceptable to the homeowner. Selecting the right finish/stain – And here is an example of a solid body stain. This is also a semi-transparent stain but in a darker color. 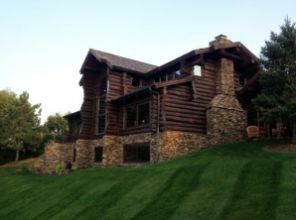 This is an example of a log home stained with a light colored semi-transparent stain. Some are applied in two coats in a “wet-on-wet process” where the second coat is applied before the first coat is completely dried. There are several water-based semi-transparent stains made especially for log cabins and homes, all of which contain UV blockers to block damaging UV rays. Looks flat and opaque, much like paint. Many times with older or neglected buildings, a solid body stain is recommended because it can be extremely labor-intensive to return older wood to a condition than would successfully accept a semi-transparent stain. Edmunds & Company doesn’t recommend using oil solid body stains because of their tendency to “flash” or become glossy. No matter what finish you choose, the building should be inspected every year to ensure that the finish is continuing to work well. 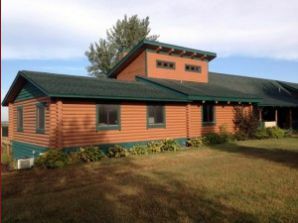 Consult with an expert on log home re-staining and refinishing. Contact Edmunds & Company or call our toll free number 715-373-5744.